Observing and photographing marine and terrestrial wildlife can be very time consuming. Therefore, prior to departing on a trip, in depth research has to be completed to determine the best season, weather conditions and animal movements - not too mention other important aspects such as transportation, accommodation, food and safety constraints. Many of the locations visited are not in first world countries, and the animals targeted frequently do not have habitats close to major airports and cities. In country domestic travel arrangements can be very time consuming and frustrating to arrange. Often an idea for a trip remains an idea for quite sometime as logistics are worked out. Whilst some excursions are just a short skip and jump from home requiring minimal organization, other trips fall within the expedition category and require far more in-depth and time consuming analysis until they eventuate. So what's in the loop? Keep updated on my travels - see the Anaspides Photography Blog (BLOG tab above). 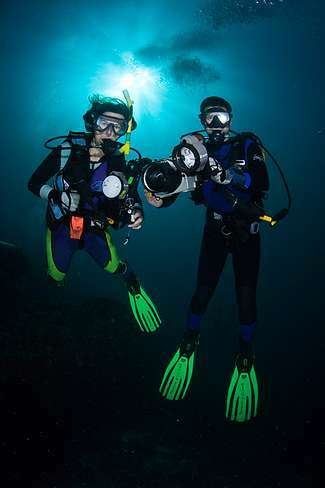 LEFT: SCUBA diving and photographing in Raja Ampat, Western Papua. Unfortunately, I will not be documenting the location of future photographic trips on this website or my Blog. The reason for this decision is because I am continually being e-mailed and contacted by people seeking information to the locations I visit. I don't mind sharing information, but when people "demand" to know where you are going and what you are doing along with details - well suffice to say, enough is enough. To those who were interested in this information, I'm sorry for the inconvenience and I hope you understand my reasons for making this decision. Seabirds, Blue Penguins, Prions & Albatross. During my last visit I had a companion :) This trip I will be alone on this isolated island.